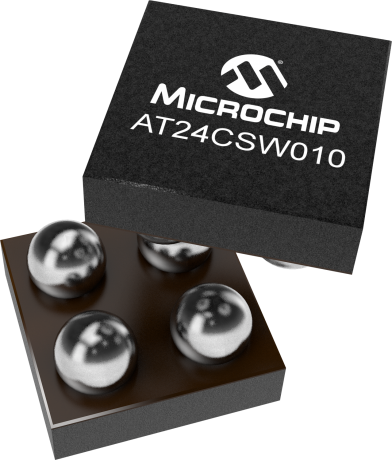 The Microchip AT24CSW010 is a 1 Kb Serial EEPROM utilizing an I2C (2-wire) serial interface. The device is organized as one block of 128x 8 and is optimized for use in consumer applications where reliable and dependable nonvolatile memory storage is essential. The device features Software Write Protection, which can be used to write protect 1/4, 1/2, or the entire memory array and also provides the user the capability to make the write protection permanent. Additionally, the AT24CSW010 includes a 256-bit security register separate from the main array. The first half of the security register contains a 128-bit factory-programmed unique serial number while the remaining half is a user programmable and permanently lockable space. The 128-bit serial number is guaranteed unique across the entire CS series of Serial EEPROM products and eliminates the time consuming step of performing and ensuring serialization of a product on a manufacturing line.